Starship Merchants is a game of timing. It uses a board which is, effectively, a large rondel of four spaces: you buy and equip a fleet of starships across the first two spaces, collect goods on the third, and sell them on the fourth. if you cannot take an action on the space you currently occupy, you must move to the next (you may also move on electively). From this simple core result some teasing situations. This turn I have to move to the market, where upgrades to ships are sold, and pilots hired. I am unable to take an action at the shipyard, which I currently occupy: I already have the maximum number of ships, and as a result I cannot buy another. However, as I enter the market there’s a decision to be made. I can, optionally, discard one of the two cards on sale there at this point and draw the top card of the deck to replace it. Currently, there are no extra cargo holds on offer, and I really want one of those. If I flip a new card with just this in mind, that would be hope guiding me rather than expectation: the deck contains too many cards to have any confidence in seeing a card of a particular kind. Some cards, naturally enough, would be much better for my opponents than for me. The pilot who rewards delivering cobalt, for instance, would favour the blue player, who has specialized in that resource, and who will also have to enter the market next turn. Ultimately, I decide to expose a new card: probably in large part for the reason that it’s more fun to do so than not. I discard a survey robot and flip a replacement; grapples – effectively an extra hold, but costly to fill. I choose not to purchase this equipment, but nonetheless I find myself exhaling in relief. After all, curiosity did not, on this occasion, prove my undoing. Teasing tricks of timing define Starship Merchants – a pick-up-and-deliver game themed around asteroid mining, designed by Tom Lehmann and Joe Huber. Luck is part of of this tease in certain cases: on occasion, a player might find himself or herself powerless to avoid leaving a plum card for an opponent who happens to be there to take advantage. The whim of the game can mean a run of gifts for a given player. More central to the outcome of a given game of Starship Merchants, however, are the tricks of timing of which it avails players. The structure of Starship Merchants is such that players must themselves actively focus upon their own timing (and keep an eye on the timing of other players). A player circles between the stages of a business cycle in a fixed order – buying ships, equipping them, collecting goods with them, and finally dropping off those goods for payment. Even if a player does not wish to carry out one of these processes on a given turn, he or she must pass through the sector in question, and spend a turn doing so. However, a player does not have to stay in the same rhythm as others: while any given sector cannot be skipped, it is possible to remain in a sector for more than one turn (as long as the player can take a legal action there). Thus, it’s possible to stay in the marketplace buying equipment for multiple turns, or to buy more than one ship at the shipyard on successive turns. Through doing so, a player can establish his or her personal pace – and spring surprises on opponents. The most substantial traps in Starship Merchants are those that a player operates to squeeze his or her fellows, rather than those the game generates by itself. The question of when to buy a new ship is considerably more important than the question of whether to buy equipment because it can have a direct effect upon other players. In particular, when a player purchases the first ship of an advanced generation it will leave an older generation obsolete – and therefore unable to operate. While the rules of the game dictate when obsolescence occurs (the first generation of ships always becomes obsolete when the first ship from the third generation is bought; the second generation becomes obsolete when the first ship from the fourth generation is bought), only the purchases of other players drive this process: nothing in the game itself directly advances it. As such, getting to the shipyard almost always provokes considerable rumination: working out, say, whether a given ship might be profitable if it is only run once before obsolescence, and second guessing, who, if anybody, might buy the ship if I don’t (and what the consequences of that might be). Even if a purchase I make does not directly trigger obsolescence of a generation, it does bring that event closer. Fans of the 18xx family will recognise that the mechanism of obsolescence derives from those games. However, Starship Merchants poses novel questions with respect to the device. Because it does not mandate all players perform a phase simultaneously (not all players will occupy the shipyard at once, or the asteroid belt at once), the timing questions around obsolescence are distinct from those in 18xx games (at least those of which I have knowledge). Further, players can exert control over the timing of the game’s end. A player with sufficient funds when he or she ends a round is able to make the discretionary declaration that this round will be the last for all players (if a player has more than 100 credits he or she may declare the round the last; if a player has more than 150, he or she must do so). A player might, therefore, scupper the plans of his or her rivals by bringing a given game to an unexpectedly early end – denying a ship an expected second chance to operate. Pleasingly, it is equally the case that letting the game continue might also be the best means to thwart rivals. Questions concerning the buying of ships and the end of the game naturally interact. A player might refrain from buying a ship which he or she could afford if it looks likely the present round will be the game’s last. Though all players will have chance to pass through the asteroid belt and earn money once the game’s end is declared (each player can work back to the dock in as many turns as desired), a ship is unlikely in a single run to earn enough to recoup the investment made in it. Those moments in which playing Starship Merchants feels the most stimulating are those in which one jerks against the flow of play at short term expense, hoping either to wrest control of an aspect of the game’s timing, or to be better positioned to weather the flow. When a player is in the asteroid belt, for instance, each ship must be run on a separate turn. A player might, very seldom, forego the chance to run a ship in order to reach the dock more quickly. There could be a variety of reasons. 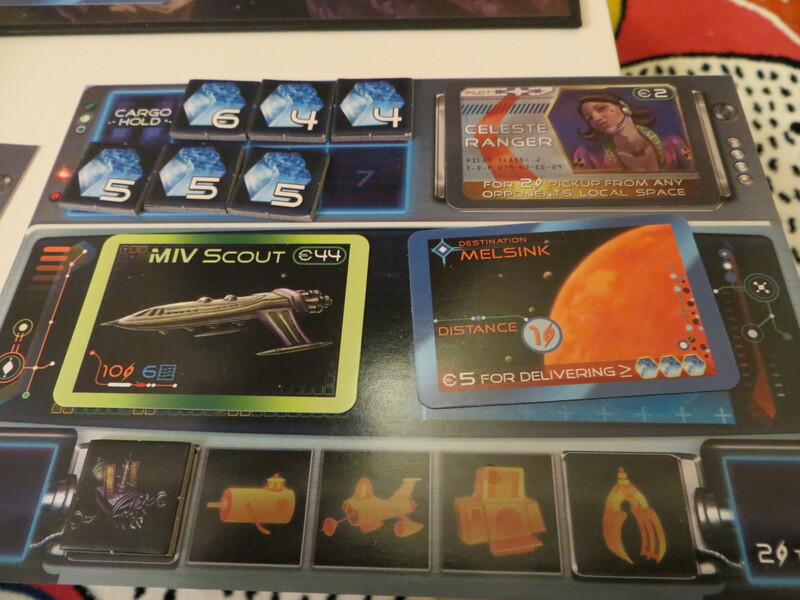 Reaching the dock before a player who intends to end the game means being able to pass again through the shipyard, market and asteroid belt, implying, potentially, significant extra earnings. Reaching the dock more quickly also means reaching the shipyard more quickly – perhaps making it possible to drive a rival’s ships into obsolescence at an especially inconvenient moment. Defying expectations can be valuable in a game in which a great deal rests upon reading the plans of others. Other questions Starship Merchants poses relate to the balance between long-term planning and opportunism. Three resources exist in the game to be mined and sold: cobalt, deuterium and ice-9. A player can set himself or herself up to extract benefit from focusing on a particular one of these – perhaps by recruiting a pilot who gives bonus credits for selling one of those goods. This focus may very well be tested, however. While goods tokens brought into the game do not ever leave it, those a player has in front of himself or herself, waiting to be mined, might – for a price – be stolen by another player. If I’ve amassed a large quantity of ice-9, say, and have many inducements to continue to focus upon it, other players might start to see value in taking tokens from in front of me. Indeed, other players might gain incentives of their own to mine ice-9. Though a permanent claim can be put upon a particular token (again, for a price), this can only happen once per round. Thus, any specialisation is ever vulnerable. Timing is again, however, important in this aspect of the game. Resources currently loaded onto a ship cannot be stolen – and, as such, reaching the asteroid belt at the right time is significant. If I’m eyeing up resources in front of another player, beating him or her to the belt might not be a bad plan. However, while Starship Merchants has much to offer (and as it’s playable in 2ish hours it’s not too dense for an evening), it is tough to recommend without certain caveats concerning its production. Though its 50s tinged sci-fi artwork is charming – albeit not top level – other aspects of its production let it down. Information is misprinted on certain equipment tokens and cards (and, in one case an equipment card and the token contradict one another). The files section of the game’s page on Board Game Geek does have FAQs, card clarifications and errata, but this mitigates, rather than removes, the impression of a sub-standard production. At a game session, it’s tough to get new players to trust in an unfamiliar game from an unfamiliar company; if they do agree to play Starship Merchants, the frequent need to warn about printing errors can reconfirm what should be unfounded scepticism. A less significant problem, which again could easily have been avoided, is that money tokens of different values are very similar in colour. It makes collecting payment, which should be a quick job, a bit of a chore. It also makes it rather difficult to read the financial situation of other players, necessitating repeated enquiry as to how much respective players possess. Given the number of great board games in existence, there’s little need to invest oneself in anything which is less than stellar, in production as well as design. 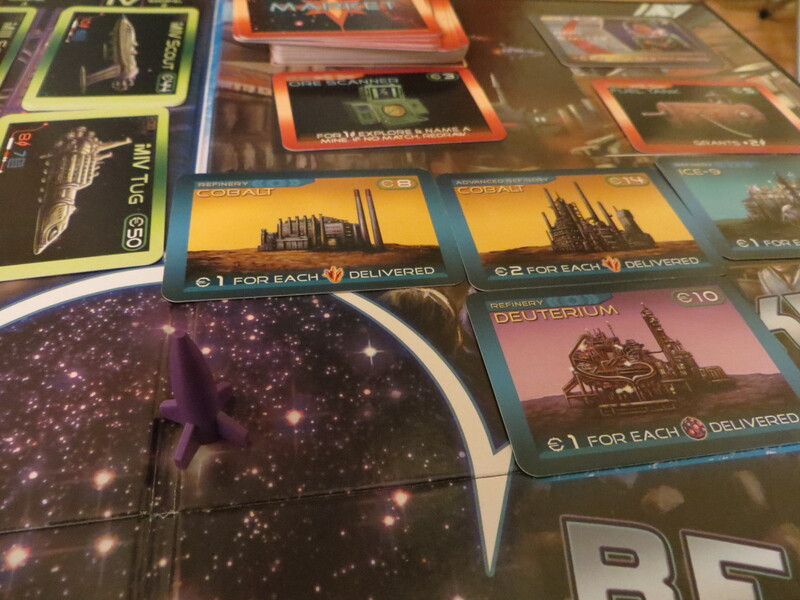 Starship Merchants is a first rate game with second rate production. The extrapolation of a certain charitable instinct, nurtured in many of us from childhood, might compel us to try and love an essentially strong game like this in spite of its surface flaws. I won’t say that instinct is entirely a faulty one. Find forgiving playing partners, be forgiving yourself, and there’s a tense and instructive experience to be had here. If, however, you are inclined to that suspect you, or those you play with, would be distracted by this game’s frustrating production, I wouldn’t blame you for avoiding it: enough games exist which don’t have barriers in front of their better qualities. In a general sense, it’s easy to credit board games with a purity. In contrast to a number of other cultural products, the board game does not directly require technology to use, and therefore feels less removed from nature. A board game is very often the work of a single auteur and can thus be felt to manifest a clarity of vision which a contemporary video game produced by a sizeable, sub-divided team might not. It’s not necessarily the case, however, that individual games are approached in such fashion – as means of experiencing purity – by either players or producers. Board games are often in major part sold on the quantity of components they provide; expansions adding even more pieces and extra rules are craved; the hobby at large tends to afford greater value to longer and more intricate games. Of the current top ten on Board Game Geek, only Android: Netrunner is recorded as taking less than 90 minutes to play. Moreover, among those top ten games Agricola employs nine game boards, 360 cards, 303 wooden pieces and 102 cardboard tokens (if I haven’t miscalculated). It also has 14ish expansions to date (some large, some small – I haven’t included individual promo cards). Eclipse has seven boards, 84 plastic pieces, over 300 wooden pieces, and over 300 tiles. It also has, to date, six expansions of various sizes. Neither is atypical in these respects. Shorter though a given game of Android: Netrunner may be, its monthly expansions mean ever greater complexity, ever more stuff under which to bury oneself. Even games not typically thought of as heavyweight are frequently sold on similar terms. The recent Z-Man Carcassonne big box proudly boasts on its enormous packaging that it includes nine expansions. Partly, this is achieved through the inclusion of seven mini-expansions. Nevertheless, the implication is that more is better: more expansions, we should understand, mean more possibilities and therefore more fun. 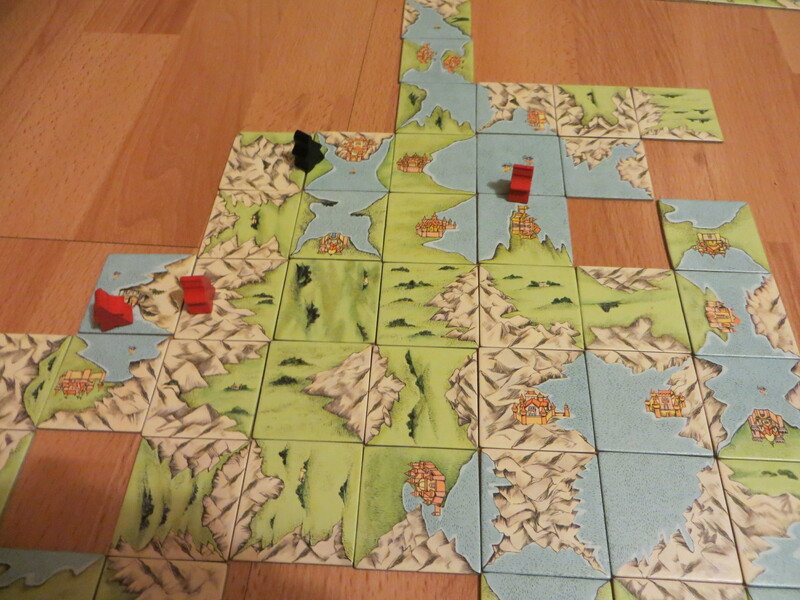 However, there’s credible evidence that Carcassonne is improved not by addition, but by subtraction. This is provided by Carcassonne: The Discovery, one of a number of stand alone titles which was added to the Carcassonne family in the middle part of the last decade (it was released in 2005). Some, such as Hunters and Gatherers (2006) and Ark of the Covenant (2003) rethemed Carcassonne and added rules similar to certain of those used in expansions to the main game. The Discovery, by contrast, aimed to purify – to reduce rules, to use less components. Its success in this is considerable, albeit not total. A terrific game (as, it should be said, is Carcassonne itself), it is also an instructive example of how great the gap can be between what the hobby of board gaming celebrates in itself, and where its real virtues lie. As a simplification of the Carcassonne system (designed by Leo Colovini, and not by Klaus-Jürgen Wrede who designed Carcassonne itself), The Discovery seems mostly to have been approached as beginner friendly alternative. This is not fundamentally unreasonable. There are fewer different ways to score points in The Discovery than regular Carcassonne, reducing the amount of information a new player must absorb during a first game. The Discovery also includes player aids for the scoring of each of its features, an innovation which could and should have been adopted by now by regular Carcassonne. However, this view sells The Discovery short. There’s a great deal here for players familiar with Carcassonne to enjoy: The Discovery is a game with fewer automatic decisions than regular Carcassonne, and fewer instances in which the lucky draw of a particular tile decides a game. The simplifications The Discovery brings all, in one respect or another, relate to the means by which points can be scored. In Carcassonne itself there are four different kinds of feature on which a meeple might be placed: cities, cloisters, fields and roads. 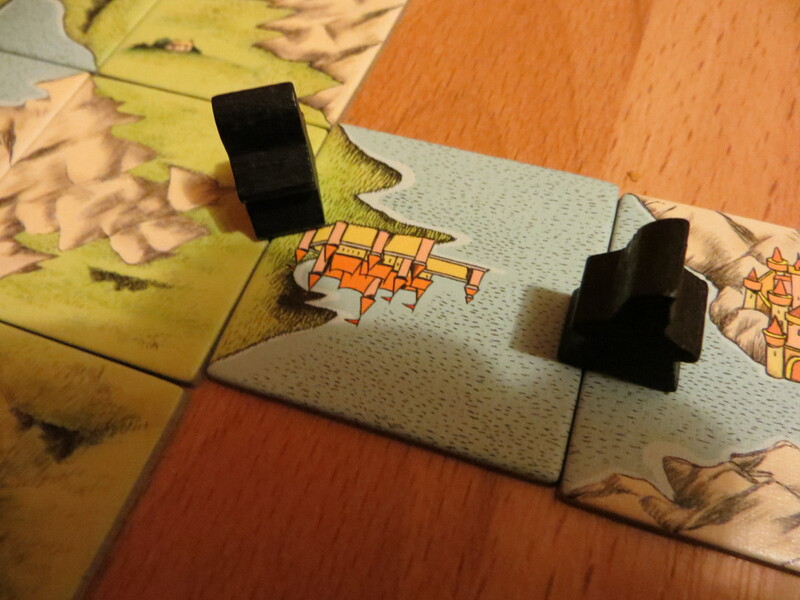 In Carcassonne: The Discovery, there are three: grasslands, mountains, and seas. The bare number is a little misleading, however. What is most important is the structure of these features, and the possibilities for their expansion. In Carcassonne, each feature is distinct not only in how it scores points, but also in the possibilities for its expansion. A road is linear: it enters a tile through a single edge, and either leaves through another edge, or terminates on that tile (since junctions end all roads reaching them, roads do not branch, though a finished map might give the impression that a complicated road network exists). A city, by contrast, can fork: when a tile has a city encompass three or more of its edges, it allows that city to be expanded in multiple directions concurrently. The cloister, meanwhile, does not expand in itself, but is developed to score more points through the placement of other tiles adjacent to it. Fields, like cities, fork. They differ in being able to co-exist on an edge with a road, making their expansion particularly complicated to control and to monitor. These differences have impact upon good play. Blocking the development of cloister is achieved through very different means from those needed to block the expansion of a city. Ensuring control of a field is very different from making sure one retains sole possession of a road. This is fine; this is flavour; there is nuance to managing the intersection of unalike structures. In The Discovery, by contrast, each terrain more closely resembles the others: each, like a city in regular Carcassonne, might occupy a single full edge of a tile, two edges, three, or even four. Thus, each terrain can fork, and blocking the growth of a given feature of each kind follows broadly the same process. The distribution of tiles feels broadly even, such that approximately a third of the final map will be covered by each. Partly this is another quality of The Discovery which makes it more penetrable to completely new players than regular Carcassonne, but, perhaps more importantly, it gives the game a greater sense of focus. In regular Carcassonne a map reading challenge sits on top of the game of placing tiles in the best furtherance of your interests. A good deal of the mental effort required to play Carcassonne well is spent on watching the expansion of fields, on reading whether given fields might connect, and, indeed, simply counting and recounting how many meeples belonging to each player occupy any particularly large field. I don’t hesitate to assert that most experienced players will have lost a game through failing to notice that two fields had connected and control changed. Certain pleasure can come from this part of the game, but there’s a lot of mental investment for limited reward. The Discovery, by increasing the clarity of its map, allows players to spend less effort to properly understand the game state. Thus, placing tiles well can more fully be the focus – as it probably ought to be. In The Discovery, only mountains are made especially particular with respect to the scoring method attached to them, in that a completed mountain range can gain in points if neighbouring areas of grassland have cities depicted within them. It takes a certain portion of mental resource to follow, but a relatively small one. The Discovery also gives each player fewer meeples to manage than does the base game: in regular Carcassonne each player controls seven meeples, in The Discovery four. In itself, this supports a logic whereby fewer possessions means greater value to each: on the majority of turns in a regular game of Carcassonne, one will probably place a meeple. This is not the case with The Discovery. In standard Carcassonne, the feature any given meeple is placed on may or may not yield a significant amount of points: one is encouraged to experiment – to start something on the off-chance it might grow. With seven meeples, some failed projects can be made up for by the success of others. With only four meeples, however, this approach is not possible. If one of four meeples gains few points, it constitutes a significant problem in terms of attempting to win the game. Thus, players need a clearer sense of how a given feature will become valuable. Connected with this, furthering the value of each meeple, is the greatest innovation to The Discovery. Meeples are not automatically returned to a player when a feature is finished. Instead, each turn the active player may, after placing a tile, either add a meeple to that tile, or remove a meeple from an existing tile, whether or not it occupies a finished feature (unfinished features yield less reward). Cheap points in The Discovery are, therefore, not cheap. It is often possible to place a meeple onto a feature which is immediately completed, but that meeple is not immediately returned, as it would be in regular Carcassonne. Thus, this kind of opportunistic play is less often worthwhile, since the meeple used cannot be reclaimed until a future turn (and, of course, the chance to place another meeple on the turn in question is sacrificed). The Discovery, then, favours those virtues many board game players flatter their hobby as possessing. It strips back and simplifies, allowing for a purer focus on pleasurable exercises. It also exhorts players to value fewer possessions more dearly. The right thing, then, would probably be to replace standard Carcassonne in my collection with this. Instead, I have both. Make of that what you will. At a large games club, as Oxford on Board is becoming, if you want to play a particular game on a given night it’s often necessary to have a strapline to tout the game in question. When snap decisions are being made, snappy rhetoric is a valuable tool. However, I confess that some of the epithets I catch myself using in these circumstances crush me a little bit, even as the words are exiting my mouth. Describing Airlines Europe as ‘an advanced Ticket to Ride,‘ for instance, might have been enough to secure myself some playing partners, but it somehow manages to be unflattering to both games at once. Still, when faced with either Hansa Teutonica or Lancaster as alternatives, I feel able to say that desperate action was necessary. With a similar brutality towards facts, as well as similar success in persuading people to play, I’ve often touted Christoph Behre’s 23 as ‘something of a reverse No Thanks!‘ Without doubt, it gives a distorted impression as to the rules of 23 – as a game it’s mazier than my pat phrase might suggest, with more meaningful choices than No Thanks! offers. However, I do think the sales device conveys the broader tone of the game with reasonable accuracy: 23 and No Thanks! alike are about agitating your immediate neighbour through the efficient use of chips and numbered cards. The two games also share the quality of testing the willingness of players to hurt themselves a little in order to hurt other players more. In No Thanks!, collecting a card which would complete a run for another player can be hard to swallow (you’ll certainly hope that someone else will do it for you), but might sometimes be the only way to prevent a player cruising to victory. In 23, by comparison, it’s about having the stomach to take minus point chips in order to employ special actions. In its raw state, 23 runs all too smoothly. 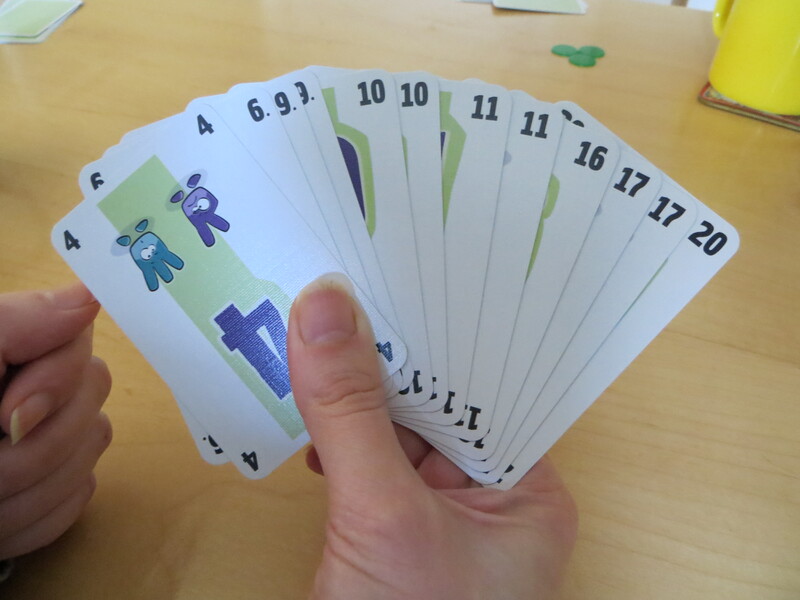 Players aim to rid themselves of a hand of cards (of numbers between one and 23), in turn placing one or more cards onto a common discard pile (more than one card can be played if all cards are of the same face value: there’s one number ‘1’ in the game, two cards of number ‘2,’ and three of everything else). The cards played must show a number equal to or higher than the card which is currently top of the pile. So, for instance, if the top card of the pile shows the number ten, the number three card still in my hand is going nowhere. Playing a card of the same value as the current top card is free, as is playing a card which is of a value immediately above the current card (so if the current card is a ten, playing another ten would be free, as would playing an 11). Playing a card of a higher number means incurring a minus point for each number skipped (so, if I played a 13, I’d have skipped 11 and 12, and so would have to take two minus points). Any player who manages to play all of his or her cards has three minus points wiped from his or her score. When dealt a hand which contains a well-spaced selection of cards, simply following the game’s own rhythm might well be a player’s best option. If one’s cards are less amenable, then trying to punch the game into a different pulse rate might be necessary. There are a few ways to do so. For the cost of one minus point (recorded by a purple chip), a player can pass, letting the turn go by without playing a card. By taking two minus points, however, a player can both pass, and force his or her immediate neighbour to play. This can backfire, of course, if you’ve guessed wrongly about what your neighbour is holding, but can be brutal. Other devices mean forgoing possible positive points: each player starts the game with three green chips. If any of these are kept until the end of the game, each one is worth two points. However, these chips can also be spent to really warp the rhythm of the game: giving up a green chip allows a player to either increase or decrease the value of the current card by up to five (meaning, if the current card is a ten, I could use a green chip, and play anything from five to 15 without penalty). Of course, any player who has compliantly followed the game’s own rhythm might be thrown entirely out of step by a substantial judder in either direction. Often the decision either to spend a green chip or to take a purple one is an ad hoc response to the current game situation. However, 23 pushes its players to imagine the game ahead, planning potential skips and backsteps, through the neat device of making each player discard three cards, from fifteen, prior to the game. Thus, you cannot help but have a vision regarding those points at which you might play a green chip to skip forwards, or to double back. Indeed, it’s hard to overstate how important this planning stage is to the pleasure 23 gives: without it, players would lack a sense of ownership over their fates. With it, there’s a sense of investment, and a tension – an almost inevitable struggle to bring the real game into concordance with the game you planned in your head. One other particularly canny aspect of 23 is the way is the control players are given over when to withdraw from a round. At any point, any player can stop playing cards, and instead take one minus point for each card he or she is still holding: though costly, this can be very potent indeed. 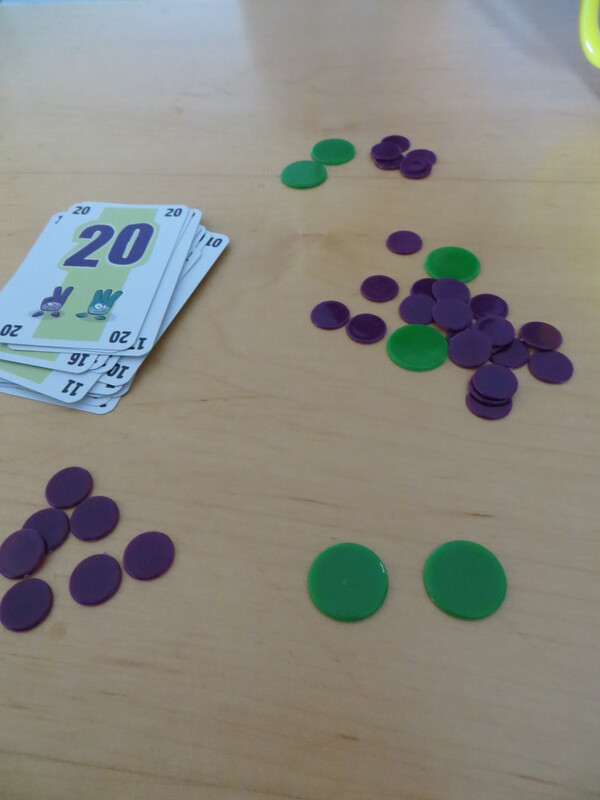 By nature, it forces a dramatically different form upon the game for the remaining active players: a player folding early in a three player game, say, effectively leaves a two player game between those remaining – which means more numbers for which no active player has a card, and therefore more cost to skip those missing numbers. In a two player game, this can be especially lethal: leaving a player either to play out his or her hand alone, potentially paying heavily to skip numbers, or to take an unplanned hit in also folding. Also, setting aside questions of strategic richness, I want to emphasize very strongly that upping and quitting is a massive pleasure. Whether it works out or not with respect to winning the game, slamming your hand down and resigning from a round unexpectedly early is a whole joy of its own: it’s not quite ripping off your tie and marching out of the office, but it’s the same quality of experience, just less strongly expressed. And a round of 23 is short enough that you only need sit for a minute or two before those suckers who didn’t dare quit finish: you’re not left waiting long enough to have to rue your rashness. I heartily applaud Behre for this aspect of 23: more ‘bugger this’ opportunities in games, please (or more chances to meaningfully say ‘No thanks!,’ if you will). Finally, 23 astutely knows what is best in terms of its larger structure. Where many lighter card games allow players to determine for themselves how many rounds to play, 23 insists that it should be played over two. The trick is that the green chips players are given at the start of the game are not refreshed before the second round. Thus, the economical use of them becomes a defining element in the experience of playing 23. An awkward hand for the first round of a game might tempt the player to part with two or more green chips in that round, but doing so means being especially vulnerable in the second round. However, a chip kept until the end of the game may well have missed a moment to be employed to greater, more aggressive (and thus more enjoyable) effect. Thus, playing 23 is a dynamic experience. It can virtually stall sometimes – passing might, in certain circumstances, become a default option. Another round, by contrast, might blister past, accelerated by the play of green chips. However, this inconsistency in pace is entirely due to the action of players: you will, very often, be glad to break the flow of the game. 23 is resilient enough to be pleasurable whether a given round dawdles or sprints. It’s also resilient enough to work well with either two, three or four players. And it’s particularly wonderful how often you can sack it in mid-game and still win. Crazy Lab, designed by Jordi Gené and Gregorio Morales, and released last month, is a curiously tricksy trick-taking number. A spin on the Sticheln formula, whereby each player is trying to avoid winning cards of a certain suit, Crazy Lab is lighter than its predecessor, but nevertheless conceals some strategy. 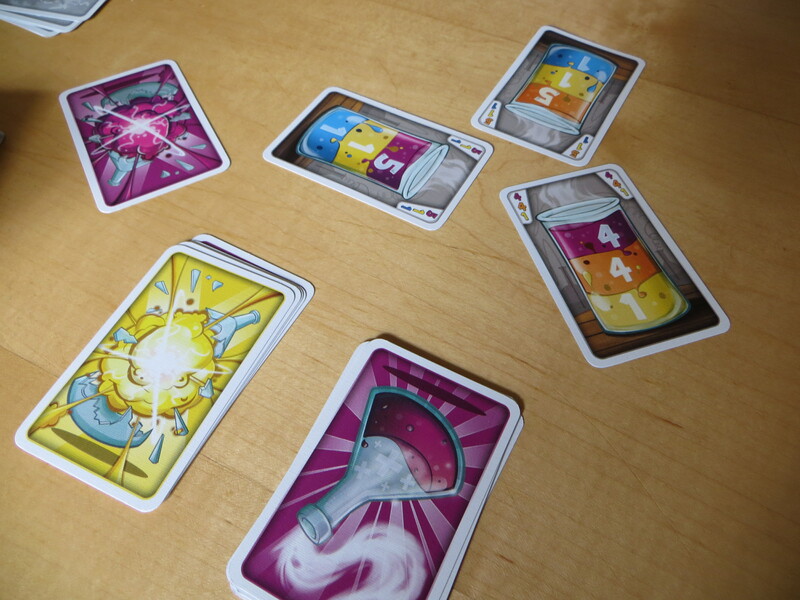 The multi-suited cards used by Crazy Lab (showing flasks with liquids of multiple colours) are a neat novelty, but can often make it difficult to read the best choice in a given situation. Partly, Crazy Lab is light insomuch as it limits its players’ choices. Unlike in Sticheln, in Crazy Lab a player’s pain colour is determined before the game begins. 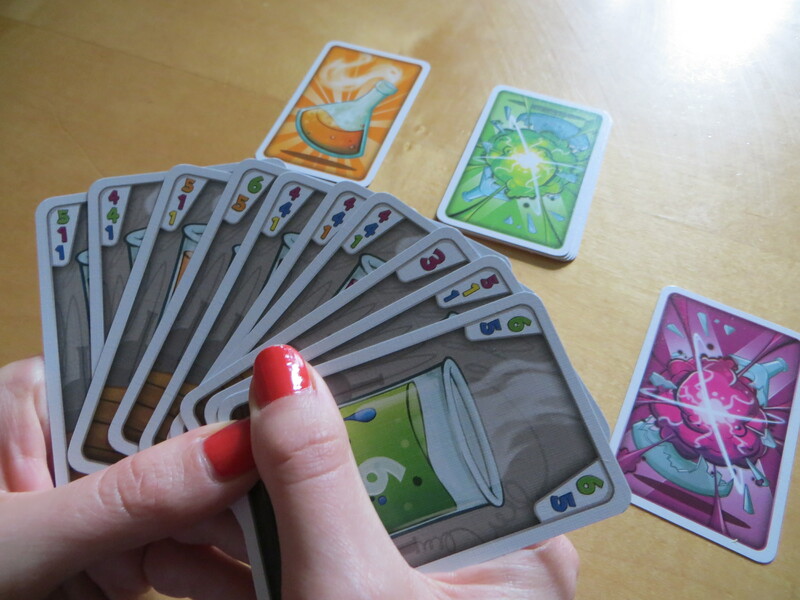 Each player’s first action, before looking at any of his or her cards, is to select one of the game’s five colours to avoid. Each player’s choice must be different. It might be that I choose to avoid yellow (that being an unpleasant colour, after all), and then find I have a hand full of yellow. Que sera sera. So be it. Пусть будет так. Crazy Lab also restricts choice in the sense that trump for each trick is beyond the control of players: before every trick is contested a card is revealed from a deck dedicated to dictating trump colour. This causes much play to be reactive: attempting to control the game is not a realistic goal in Crazy Lab. If I win a trick, and thereby become starting player for the next trick, it’s very difficult to know whether that might help or hinder me, in that I don’t know what colour will next be trump. Grabbing a trick that brings a good haul of points is thus a calculated risk: I might face a situation in which I cannot avoid receiving a large number of negative points from the next trick. It should, however, be said that the trump colour deck is at least partly player composed. In addition to his or her regular cards, each player has four cards (in all the colours other than his or her pain colour): each player contributes two of these to the trump deck. It’s difficult to attend to the flow of this deck, but, in each game a player at least knows two colours that will be trump, albeit not when those times will be. In addition, Crazy Lab is light in that limits its the ability of players to analyse their positions relative to one another as the game unfolds. There are 95 regular cards in its deck, ten of which will be dealt to each player: thus, even with five players, just over half of the game’s cards will be in play. This means card counting is largely meaningless: attempts to deduce whether a given opponents has a strong or weak hand are likely be futile, given the limited information available. But then, a trick-taking game consisting of only ten tricks can probably be expected to be pretty light (multiple rounds could be played, though this is offered as a variant in the rules, rather than as a standard way to play). Moreover, Crazy Lab asks each player to choose a colour in which to gain points (unlike in Sticheln, in which any card not in a player’s pain suit counts positively towards his or her score), but keeps this information secret. This colour cannot be one of the two which the player has offered for the trump deck. It might be deducible – if a player makes a serious attempt to win a particular trick, there’s probably a reason why – but it is not necessarily the case that the colour each player desires will be clear by the end of the game. This again serves to give Crazy Lab a very insubstantial outward impression. Indeed, a new player starting his or her first game of Crazy Lab might well be confused by the absence of information available to give direction. Choosing which colour to collect can be tough; figuring out how to go about collecting it without exposing oneself can be even tougher. Stephen, playing normally, might be quite excited by the powerful green cards in his hand. He could select green to be the colour in which he gains points (unlike in Sticheln, for those familiar with it, the number shown on a positive card is important in calculating score: if Stephen picked green, and won one of those green cards, it would be worth six points). He could, however, add green to the trump deck, perhaps picking blue or orange as the colour in which to gain points. Whenever green would be revealed as trump in that case, Stephen would be highly likely to win the trick, and could still give himself a good number of positive blue or orange points in doing so. In actuality, it turns out Random Stephen nominated yellow his positive colour, twit that he is. I suppose these examples are silly. In the end, the two real players scored plus 9 and plus 10, Stephen plus 2. In a second game, the scores were plus 31 and plus 19 to the two humans, plus 7 to the lamentable Stephen. In each game, it was only really in one or two tricks that Stephen showed himself to exist only as a fabricated personality given to a dumb experiment – most dramatically in the incident above, which netted Stephen minus 6 points, all told. In that Stephen himself did not know what colour he was collecting, he masked his aims well. And therein lies the rub. A game of Crazy Lab appears to be about one or two key tricks, though which tricks are key will be different for different players. There might be one or two times in a game when the colour you’re trying to collect is the current trump colour. This is where Crazy Lab presents a challenge – to make the most of such tricks, while, if possible, hiding that the trick in question was one you actually wanted to win. There might be a bit of managing one’s talk, attempting a bit of misdirection – but too much might draw suspicion. It’s possible, of course, to win points when one’s desired colour isn’t trump, but this is more likely to be the product of opportunism, rather than skilful play. The rest of Crazy Lab feels like a muddle: trying to offload cards that are either detrimental to your plans, or, more often, irrelevant to them, hoping they won’t reach someone who actually wants them. For a new player, this muddle might, broadly, be bewildering: it’s often not really analysable which card is best discarded – in contrast, I guess, with most trick-taking games. Naturally enough, such decisions will cause some players to stutter: it might feel, to some, as if there should be an objectively best choice, and the best course of action should be analysable, when, frequently, this is not the case. For me, though, Crazy Lab is, broadly speaking, an enjoyable muddle. A good amount of the time, you can revel in slapping down pain cards on other players, secure in the knowledge that there’s no way you could or should be trying to win a given trick. You can enjoy being out of control in Crazy Lab in a way you cannot with other trick-taking games, because here there’s no realistic means to ever establish control. Time, as it does with ostensibly simple games, might reveal a few more nuances to strategy, but Crazy Lab will doubtless remain a game in which a lucky player will often outdo a capable one. However, Crazy Lab possesses many qualities which are desirable in a ten minute game: it’s simple to teach and play, and somewhat silly, but not at all banal. Playing board and card games over the years has given me confidence in my skills as a manipulator. In negotiation games I consider myself an eloquent persuader, while I also enjoy exploring non-verbal means to shape opponents’ decisions (I’ve written before about my conviction that paying attention to how quickly one plays one’s card in 6 Nimmt! constitutes a key tool to steer opponents’ choices, for instance). Even in eyes-on-your-personal-playing-board, don’t-talk-to-me Euro games, I look for means to nudge my opponents into making decisions which pass on benefits to me, be it through means innate to the game’s mechanisms or not. Whether to fan my cards or not; how many words to spend in an auction game, as well as how much money; even which colour to play as: all these have I considered in various games in terms of their potential to influence my opponents. However, whether this all contributes to masterful manipulation or skilled self-delusion, Kakerlakenpoker Royal has shown me beyond any reasonable doubt that I am absolutely terrible at manipulating through outright lying. Blunt, repeated falsehood dominates this wonderful card game by Jacques Zeimet. Many times per game, one must pass a face-down card to an opponent of one’s choice making a claim, which may or may not be true, about what that card depicts (all cards in the game show animals traditionally considered unsavoury, such as cockroaches and rats). Making the false seem true and the true seem false is pretty much all there is to winning at Kakerlakenpoker Royal: if an opponent successfully reads your claim (deducing correctly whether you were lying or not), you place in front of you the card which you were trying to pass, and you remain the active player (i.e. you must try again to pass a card and deceive an opponent). Trick your opponent successfully, and he or she must place the card in front of himself or herself and become the active player. Being a poor liar, I lose often. This happens when you end up with four cards in front of you depicting the same animal, or when you have run out of cards to pass. All other players win. Losing in Kakerlakenpoker Royal is never undeserved. You will have lied poorly, and you will have read your opponents poorly. But losing in Kakerlakenpoker Royal is fun. Indeed, Kakerlakenpoker Royal might well be my game of the year. An unfussy, fifteen-minute blitz of bluff, in the three months since its release it has tended to be the first game I’ve reached for to demonstrate the kind of games I enjoy to friends unfamiliar with modern board and card games. No other game I’ve played this year has been as reliably pleasurable to play with new players. In large part I’ve had such success showing off Kakerlakenpoker Royal because it is a game which recognizes the importance of making a fine first impression. Even before the rules have been explained, the vivid artwork tends to have elicited favourable comment when I’ve played. I see why: I very much like Rolf Vogt’s style, and the assortment of unloved creatures which fill the deck of Kakerlakenpoker Royal represent ideal material for him. The playful pictures also neatly communicate the silly spirit in which the game must be played. Beyond appearances, the rules in themselves are largely easy to explain, and, more importantly, the point in playing is apparent from the very first turn: whereas the pleasure in an engine-building game can reveal itself slowly, often only becoming apparent when (or if) that engine starts to work, the fun in Kakerlakenpoker Royal is quick to uncover, both for card game veterans and new players: the excitement in seeing whether or not a player was bluffing is both immediate and repeated. The pay-off, that the same basic decision (is he/she lying or not?) is repeated throughout the game, matters little to me: in that Kakerlakenpoker Royal takes fifteen or twenty minutes to play, it would sacrifice too much to attempt to squash much of a build-up into that time. It would also miss the fact that human beings are such continually fascinating, surprising objects of study: no two people lie the same way, and even a single individual will explore a range of strategies for deception when under the spotlight repeatedly. You might try watching for hesitation, for evasion of eye-contact, for a trembling voice, but each game will throw up new tells to spot and track in their development. However, at least one significant issue with Kakerlakenpoker Royal might be seen to exist: that optimal play could be felt to demand picking on the first player to accumulate a few cards. I’ve not yet witnessed this approach utilized, though, nor particularly been the victim of it myself in any of my numerous defeats. Though in certain company vicious play would have a fun of its own, I think it’s easily understood that fully including all players tends to be the best route to a good experience for everyone – and thus, few players need nudging to act this way. I also think players naturally worry that they become more readable the more often they attempt to pass cards to the same player. Moreover, Kakerlakenpoker Royal does allow an alternative to calling when passed a card. Instead of declaring whether you suspect a player was lying or not, it is possible to peek at a card which was passed to you. If a player does so, he or she must then make his or her own claim about that card (which may or may not be the same as the initial claim), and pass it on to another player. Through this, play can be spread around, and possible spitefulness and repetitiveness mitigated. It should be explained that Kakerlakenpoker Royal is not an entirely new game: instead, it is an update of 2004’s Kakerlakenpoker and has a few further elements which represent additions to the original. In Kakerlakenpoker Royal, one of each animal is a king or queen. This therefore gives each card two qualities: being a given animal, and being royal or not. When passing a card, a claim can be made about either quality (e.g. – ‘It’s a scorpion!’ or ‘It’s royal!’). A player who must place a royal card in front of himself or herself also has to place an extra card as additional punishment. This additional card is from a set of seven extracted from the regular deck at the beginning of the game to create a punishment deck, the top card of which is left face-up. Attention to the punishment deck is therefore of some importance: if one already has a couple of toads, say, and the current punishment card is a toad, having to take a royal card (toad or otherwise) would be particularly painful. The other additions are two unique cards: one shows no picture: when passed, claims about it are always false. The second, almost the reverse, can represent any animal (and those claims are considered true), though it is false to claim this card as royal. Should a player misread the claim when one of these is passed, instead of placing the special card in front of himself or herself, the player must substitute an appropriate card from his or her hand, or two cards with other pictures (i.e. if the card was passed with the claim that it was a fly, then the player should use one fly card from his or her hand, or two non-fly cards). Then the player takes the special card into his or her hand, and may pass it on when or if he or she wishes. These special cards do give players more options, but I haven’t found the choices they offer to be interesting enough to justify the confusion they often cause. That the changes from Kakerlakenpoker are slight means that Kakerlakenpoker Royal retains the feel of a game from an earlier time. In my view, this is not to its detriment. It is pure in its focus in a way few games of this period are: lying and reading lies is everything here. That’s not just fine, that’s great. It means this game cannot really be gamed, only played, and Kakerlakenpoker Royal is a game which it is a joy to play. If I’ve ever included an exhortation to buy a game in a review, or ever beseeched readers not to purchase one, I apologize. I don’t believe I have ever done so: I have certain rules for myself in writing this blog, not all of which I wish to place on record. One is not to make the implication that the only way to value a game is to own a copy. However, as I add more and more reviews to this site, an unwanted implications about my view of value of games seems to emerge. A tide of reviews, whereby a given game floats briefly into sight, and then is addressed no more, misrepresents the sustained interest board and card games frequently offer, and which is of particular importance to me. I don’t deny enjoying the mental fireworks a new game can produce, but that’s not what motivated me to start this site. By revisiting games reviewed previously, I want to make more of the question of lasting value, and to consider, in some respect, the changing experience growing familiarity with a game can provide. At the time of my review, I had owned a copy of treasure hunting game Tobago for about six months (though I had played a friend’s copy before), and I had probably played in the region of a dozen times. I reckon that since then I’ve probably doubled the number of times I’ve played. I don’t keep a precise record, and nor do I wish to start. I did not have hesitation in making Tobago the first game reviewed on Painted Wooden Cubes. It’s engaging as a physical item, it’s approachable to players unfamiliar with modern board games, but it provides opportunity both for broad strategic vision to be realized, and for moments of tactical inspiration to emerge. As one of the most beautifully produced games I’ve seen, Tobago justifies its existence as a board game rather than, say, an iPad app: its three interlocking wedge-shaped boards contribute to a more enticing presence on the table than a standard rectangle might, while the island furniture has heft and tactile appeal – it still pleases me each time I play that the statues are pretty heavy, and have a rough surface that actually feels like stone. Tobago‘s approachability lies in the fact that its core idioms can be translated into the rhetoric of a former generation of family board games. Each player has a personal playing piece which moves around the island, a device which can help those acquainted only with traditional games to avoid feeling lost. Similarly, the process by which the location of each treasure becomes defined, while not exactly deduction, ought not to feel wildly unfamiliar to a person who has played Cluedo. To those with less experience of modern board games, getting to grips with Tobago doesn’t doesn’t have to feel like learning a new language. Its scope for strategy is in the potential each player has to manipulate which treasures are likely to be discovered, when, and by whom. The opportunity to provide the first part of a treasure map is particularly important. Starting with a map piece which determines that a treasure is on the beach will immediately leave a small number of possible locations – perhaps ten or so. Starting with the reverse – a map piece which explains only that the treasure is not on the beach, leaves probably a hundred places in which the treasure might be. The choice is therefore not inconsequential. Amulets, which appear on the edges of the island and allow special actions, tend to provide tactical opportunities. These make possible, for instance, snatching a treasure from under the nose of another player by moving extra distance. Deciding when amulets are best used – and, on the other hand, when a turn is best devoted to collecting amulets – represents another choice to which brainpower can usefully, and meaningfully be devoted. Some, I believe, have suggested Tobago becomes stale with repeated play. I disagree. Though the nature of its decisions does not change greatly from game to game, the best choices do differ. Each play will present the dilemma of whether to use an amulet or not, or whether to start a new treasure map with a limited or wide range of possible locations. The answer to each is sufficiently situational that the thought process will be new each time, even if the question is familiar. Indeed, the primary issue I have in personal experience with Tobago is the dismissive approach to it I’ve encountered among those who play modern games frequently. I suspect the respects in which it recalls established family games work against it here: it seems often to be dismissed as retrograde eye-candy. I’ve rarely made much of playing partners and playing environments in my reviews proper – such concerns are awkward peripherals to include in commenting on a game in itself, but I think, regrettably, this is a game is particularly apt to be given unfairly short-shrift by this kind of player. I’ve tried emphasizing that it’s a stock game in disguise – a claim I think true – but I haven’t found this approach a huge success in interesting seen-it-all-before players. Original review from 18th December, 2011: The Rajasthan-tastic Journey? Jaipur, a two-player trading game, had at the time of my original review established itself as a wife-game of choice among that large, vocal part of the Board Game Geek fraternity with interchangeable, nondescript wives. It is still very popular in this capacity with that audience. I felt its acclaim not entirely warranted at the time of my review, and still feel unimpressed now. I had owned the game for just over a year at the time of writing the review. I have since traded it. I was ready to part with it because it didn’t provide sufficient interest to me to feel much more than a means to kill time. As I made much of in the original review, its interaction is very two-dimensional: the choice on each turn is always one of collecting or selling. When playing, I find myself feeling I’d rather just have a conversation, to enjoy a more varied back-and-forth. It’s not a game I would ever find myself thinking about during quiet moments. With some games I’ll find myself, say on the bus or in the kitchen, pondering the feasibility of a particular play-style I haven’t explored, or the potential to get a given card combination working. That never happened with Jaipur. The experience of it did not evolve, and never felt especially enriching. I haven’t missed it. Onirim, by contrast, I think about a fair amount: more than I actually play. I guess its evocative art, and the theme of exploring a labyrinth of dreams, contributes to triggering idle rumination. In a way I don’t with Jaipur, I find myself getting lost in the mathematical possibilities the game offers, sometimes months since I last played. I’ve had a copy almost two years, and have probably played fifteen times in that time. Not a great deal, perhaps, but, for me it’s about revisiting the game as an imaginative experience, rather than mastering its strategy. Just as a good film can be watched too frequently, I think the particular, special mood of this game is not best penetrated by frequent play. The game is about getting lost; it’s not a game at which to get too good. As such, perhaps peculiarly, my goal has not been to explore the whole of the game. I guess I’ve learnt a bit about successful play in my time with it, and I do utilize that when playing, but it’s one of a very small number of games I play repeatedly with which I’m unconcerned about my success rate. Make of that what you will in processing my still wholehearted recommendation of Onirim.